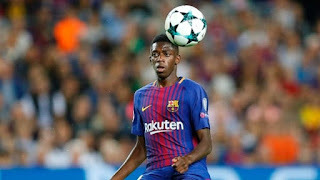 FC Barcelona forward Ousmane Dembele has suffered another hamstring injury and will be out of action for between three and four weeks, the La Liga leaders said on Monday. The French winger, signed last year from Borussia Dortmund for a fee which could rise to 147 million euros, suffered a hamstring tear in September that kept him out until January. Dembele featured in four games after returning, starting one, before suffering a new problem in the 4-2 win over Real Sociedad on Sunday. “Tests have confirmed that the player has suffered a hamstring injury of the semitendinosus muscle that does not affect the area operated on earlier in the season,” FC Barcelona said in a statement. Dembele will miss King’s Cup and La Liga matches but should return before the UEFA Champions League last-16 clash against Chelsea at Stamford Bridge on Feb. 20.